I just got my orders to go back in with the 25th Division Broncos. I am very excited. I hope to reconnect with some of the soldiers I interviewed before. I also want to go over to FOB Joyce. My blog about FOB Joyce gets the most hits! Interesting news regarding Panetta's decision. I am eager to hear how the soldiers feel about this. I just don't even know how to react to this? Here is some good news out of Afghanistan. Courtesy of Jaala ThibaultThe author teaching a group of teachers on methods for English language training at the Kabul Education University. 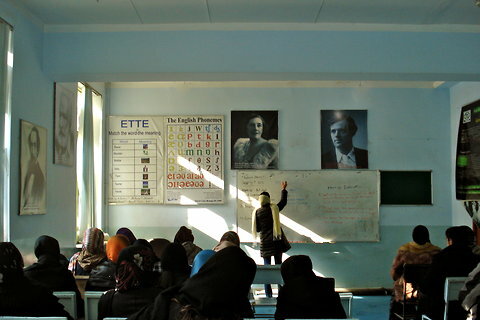 In this story the the Author tells how different a classroom is now at the University of Kabul. There is a mixture of boys and girls learning side by side. The girls wear mini skirts over skinny jeans, ballet slippers, knock off Versace sunglasses and trendy head scarves from Dubai! These changes could not have come without our presence in Afghanistan. We have made a difference!